The first time I switched on the television set in front of Tariq was the day he turned 2 years old. The reasoning is totally science based. Before that, the only thing Tariq could see on the TV screen at home was a black dark screen! Lol. And the first thing I decided to show him was the National Geographic Wild Channel or famously known as Nat Geo Wild. Actually it was one of my dad's favourite channels too. Today, 4 years later, Tariq still enjoys watching the same channel. Animal kingdom has really fascinates Tariq. And he kinda emulate some of what the animals did too. There was a time when he was about 2 and 3 years old, whenever someone he doesnt know tries to come close to him and Tariq sense danger (ie he can sense someone is about to pinch his chubby cheeks! ), he would growl and roar like a tiger! It was terrifying and cute at the same time. My dad always reminded me that to soften Tariq's heart, to make him learn what is compassion and how to be compassionate, is to always keep him close to the animals. Alhamdulillah, thanks Abah for your wise advice. 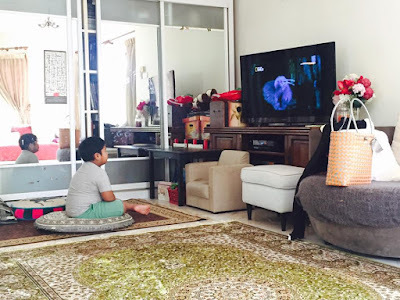 We couldnt literally keep him close to the animals all the time, so your favourite National Geographic Channel is the second best option we can give Tariq, alhamdulillah!